Three journalists have been confirmed dead in an auto crash this afternoon involving the convoy of the Edo State Governor, Comrade Adams Oshiomhole. 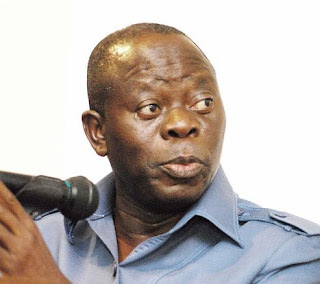 A statement by the Special Adviser (Media) to Oshiomhole, Tony Iyare, said the news men were those with the African Independent Television and Independent Television. While a staff of AIT died, two who work with ITV lost their lives. Iyare said in the statement titled: Oshiomhole’s convoy in road mishap: "Three journalists died while several others including security details were injured when a tipper lorry rammed into the convoy of Edo State Governor, Comrade Adams Oshiomhole. "The accident occurred about 12.45pm, shortly after the convoy which was coming from an Action Congress of Nigeria (ACN) rally in Afuze, passed Warrake, located in Owan East Local Government Area of the state. "The incident happened when the lorry lost control, veering off its track and heading straight for the Governor’s car missing it by the whiskers. "It later hit the Toyota Land Cruiser conveying security details which immediately somersaulted. The lorry also hit the bus conveying the Government House Press Crew. "The three journalists – two from Independent Television (ITV) and one from African Independent Television (AIT) lost their lives. Several other journalists and security details who sustained various degrees of injuries are now being treated at Otibhokhai Specialist Hospital, Irrua and Central Hospital, Benin City. "Oshiomhole, visibly shaken by the unfortunate event personally supervised the ferrying of the casualties to the hospital. He later paid condolence visits to the bereaved families. The planned rally to kick off Oshiomhole’s campaign in Edo South Senatorial Zone scheduled for Saturday was put off as a result of the incident." Hmmm I jst hope there is no political undertone to dis incident..They shld jst plss oo, we already hav serious battles to fight than 4 them to start takin innocent pples lives again..May their souls RIP. The news don spread o. Is it just an accident or targeting murder..? Naija sha, God go helep us 4rm mago mago. Its either a failed Boko haram attempt or a political assasination on d Governor. This news has gone far even it brought about a tremendous views. We hope not poiitical crisis. It's really sad. I particularly feel sorry for the families of the deceased, pray the Lord will be with them. At this point, much as I know that accidents don't give a warning before they happen, we need to pay attention to our roads, condition of vehicles especially the trucks. Furthermore, our healthcare or lack of it needs to be addressed. I doubt if they had ambulance with paramedics to pick the survivors, these are basic things in a sane society. I think the Governor was their target but its like he is strong God wise or juju wise. Now 3 innocent men who are not even politicians have died. *smh* for politics. someone is now a wailing widow, some children are now fatherless. God help us. My sentiments exactly! What's d difference btw "died" & "lost their lives". Dumb press release. Mtshewww! Politics in naija 4u, i onestly think it ws an assasination. Wats d diff btw dyin and losin lyf...hmmm english wahala. Na wa. Just thinking. Much as I can never wish ill of any human it still begs the question. How come every near miss traffic incidence of a governor's convoy you read about often reports that the governor came out unscathed. Meanwhile others in his entourage will see death. E get as e be sha. E get as e be. All for the road... Was that what the coven asked for? People just follow-follow to their untimely death. They didn't have third eyes on duty. RIP! Convoys in this country speed too much. They need to be controlled . So many accidents have happened in the past and still no lesson learnt . Governors control your thugs!! Those who talking of Cabal and Juju or PDP being after Oshiomhole are myopic and don't want to face the fact that there is reckless driving, indiscipline and lawlessness in this country .I feel so sorry for innocent lives lost. NOBODY IS AFTER THE GOVERNOR ! ! . He should control his men. Abeg make we hear Word. Exactly what I thought while readind the story. How can Mr Iyare write that?? I don't understand why people can't write n go through what they wrote to ensure it makes sense. Well,hope he corrects it o!! For the departed,I pray they rest in peace. For their familes,I pray courage,comfort, fortitude n peace to bear the irreparable loss.